We are in week five and at this point only two teams in the National Football Conference remain undefeated; the Philadelphia Eagles who had a bye last week and the Minnesota Vikings who have won 4 games in a row. The big question this week is, can the Minnesota Vikings continue their winning streak? Or will the Texans rain on their parade and defeat them at home? The Vikings are 6 point favorites in Sunday’s match, so far this is their highest point spread this season, which doesn’t seem unreasonable since aside from their 3-point win against the Packers they have beaten every other opponent by at least 9 points, including their 14 point win against the NY Giants in week four. 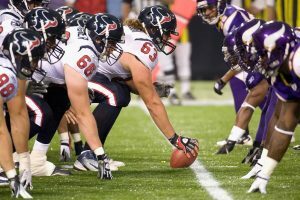 The Vikings have the best defense in the entire NFC, and let’s face it, the young Texans quarterback Brock Osweiler doesn’t have the best offensive record, so far he has 949 passing yards for five touchdowns but he continues to struggle with his interceptions, he already has 6, so it is fair to say, he is not having the best football wagering season, and it might be nearly impossible for him to score against the Vikings defensive lineup. Having said that, the Houston defense gave a pretty good performance last week as they held Mariota to a mere 202 yards with no touchdowns, and they didn’t have J.J.Watt on the field, he is also not expected to play this week, which could spell trouble for the Texans. Sam Bradford, has done better than anyone expected, and although he is not leading an offensive powerhouse, he is doing enough to win games. Wide receiver Stefon Diggs and tight end Kyle Rudolph have been catching great passes and turning them into some big plays. The three seem to have found a good way to work with each other and I don’t see any reason to think this week will be any different. Bradford who has only played in 3 games with the Vikings, has thrown 719 yards for 4 touchdowns and no interceptions. The Minnesota offense has been pretty solid even without Adrian Petersen; running back Jerick McKinnon was great against the Giants on Monday Night, rushing for 85 yards in 18 carries, I expect McKinnon will be the go to guy now that Petersen is injured. Minnesota has been averaging 22 points per game, whereas the Texans are averaging 17, and I have trouble seeing how they will manage to score against this Viking defense, after all this is the defense that held Eli Manning, the two-time Super Bowl champ to only 10 points last week. Now imagine what they can do to Brock Osweiler and his offense. When you break it down, the Vikings defense are allowing an average of 12.5 points against them against much better offensive teams. This is for sure the toughest week for the Texans thus far. The total for the game has been set at 40, considering the differences between the Texans offense and the brilliant Viking defense, I will certainly advise you take the under in this game. As for the winner of the game, the Vikings will continue to be undefeated and don’t worry about the spread, they are sure to cover it. Make sure you get your bets in early at Ace Sportsbook before the NFL football betting line moves against the Vikings.